My current tally is 1,279 different coasters, which I've ridden at 332 parks in 19 countries in North America, Europe, and Asia. Here is a list of some of the more noteworthy trips I've taken to add more to my tally. There are still many more coasters I can ride around the world. See Roller Coaster Database for a comprehensive listing of coasters I need to ride throughout the world! In June 2018, I returned to Finland, Sweden, Norway, and Denmark for two weeks with the European Coaster Club. We visited 17 parks and I rode 80 roller coasters there, 40 of which were new additions to my coaster log! Download Summary map of trip. In March 2017, I toured the United Arab Emirates with with the European Coaster Club. We visited 10 parks in Dubai, Abu Dhabi, and Sharjah, and I rode 22 roller coasters there. In June 2016, I toured the midwest and southeast USA with with the European Coaster Club, where I travelled more than 3,500 miles to visit 12 states and ride 98 coasters (25 new for me!) at 16 parks. Download Detailed maps of trip. In August 2015, I toured Italy with the European Coaster Club. See trip reports and photos on the ECC website. In June 2015, I toured New England with the European Coaster Club. In August 2010, I toured China (Beijing, Shanghai, and locations nearby) with a group of 17 other coaster enthusiasts. We visited 29 parks and I added 58 coasters to my coaster tally. In July 2013, I toured China again (Hong Kong, Shenzhen, Wuhan, Shanghai, and locations nearby) with the European Coaster Club. I reached my 1,000th coaster milestone early in this trip! In April 2012, I toured France with the European Coaster Club. We visited 6 parks (plus one additional park that I visited in London) and I added 20 coasters to my coaster tally. In July 2011, I toured Germany with the European Coaster Club. We visited 24 parks and I added 72 coasters to my coaster tally. In June 2010, I toured eastern USA and Canada with the European Coaster Club. In September 2009, I toured South Korea and Japan with the European Coaster Club. In June 2008, I toured the Midwest USA, again with the European Coaster Club. We visited 19 parks in 15 days in Texas, Arkansas, Missouri, Indiana, Illinois, Wisconsin, and Minnesota. 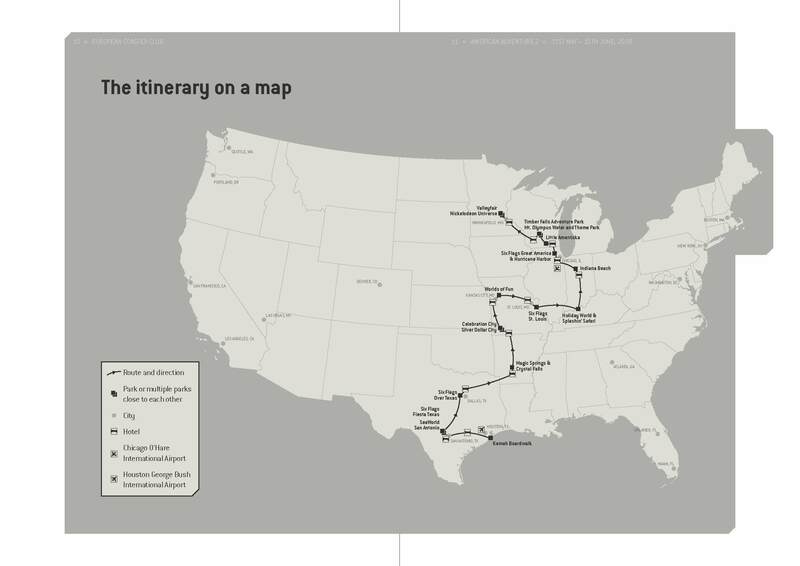 See map of the American Adventure II journey. In July 2007, I toured through Scandinavia with the European Coaster Club. We visited 13 parks in Finland, Sweden, Denmark, and Norway. In September 2005, I toured Japan with ACE and the European Coaster Club. In Summer 2003, I returned to Europe for a business trip, but found time to ride several more coasters in Barcelona and Salou, Spain, as well as in Paris, France. In July 2002, I went to Europe with American Coaster Enthusiasts (ACE) and rode 91 coasters in England, Wales, Belgium, Netherlands, Germany, and France. See pictures from that trip. See a map of the trip.